Sweet tale of rejection, acceptance, and finally love. Bagel gets the brush-off from all the bakery pastries. He gets treated like day old bread by everyone from Doughnut to Pretzel and everyone in between. He feels totally crummy. His dreams of tap-dancing like Fred Eclair are dashed, until he meets a tempting little tap-dancing cupcake. They make a tasty pair winning the dance contest and each other’s hearts. Oh, did I mention puns? You figured that out, huh? Between the flat out rejection from the Matzo to the icing on the cake, you’ll be happy you found this scrumptious treat. And hungry? Don’t get me started… had to search Pinterest for some yummy valentine pastries. Which is your favorite? Send me your recipes! Sure, and if this isn’t enough… there’s glitter! The cover art and final page is fancy, sparkly, shimmery heaven for glitter junkies! Groundhog has one job. And he does it well. Every year on his special day, Groundhog leaves his home and checks the weather. If he sees his shadow there will be six more weeks of winter, if he doesn’t there will be an early spring. Every year Groundhog’s friends gather around to hear his weather prediction. Every year, half of them are happy and the other half are not. But Groundhog calls it like he sees it. Then one year his friends each decide to try to influence his prediction with gifts and bribes. No celebration of Groundhog’s Day would be complete without Groundhog’s prediction. Every kid (around here at least) wants to know if he should trade in his sled for a skateboard or if he should leave out his hats and mittens for another six weeks. Can the groundhog really predict the weather? How will Groundhog keep all his friends happy. A little dose of honesty goes a long way, and Groundhog learns that calling it like he sees it has its advantages. This is Kristen Remenar’s first picture book and her husband, Matt Faulker’s thirty-ninth picture book. Together they have produced a pretty good one here. Like Groundhog says, “I just call it like I see it”! What’s not to love? A boy and his dog, morning routine, and colors! Denise Fleming has done it again, created funny endearing characters while skillfully infusing preschool life-lessons like making choices and self sufficiency. Even a two year old can tell you that socks belong on your feet not in your mouth, but Maggie loves to chew things. Maggie is a good sport though and allows Michael to dress her before he dresses himself. And I bet no one is surprised that Maggie is found chewing on something when Michael gets home. I was lucky enough to score an Advanced Reader Edition this week when my friend and critique partner returned from the American Library Association’s Youth Media Awards in Boston. Michael and Maggie will be available to everyone in April this year. I’m sure it will quickly become another Fleming classic! Swanson and Behr are co-creators of over sixty books and their lives together which include their three children. Their depiction of a less than enamored sibling is a comical twist on the traditional ‘I’m a big sister now’ story. The mischievous protagonist with a genuine conflict gives new meaning to the word brotherhood. Definitely not your sweet run of the mill story, but you’re going to love this feisty little girl who calls it like it is! Big Sister is upset when her baby brother arrives. Her whole life is turned upside down and no one seems to care. The baby has overtaken her room and even her club. He doesn’t know how to act at parties, stand on one foot, or throw a frisbee. Then she starts to see the value of having a baby brother. She begins by teaching him everything she knows and together they manipulate their parents into submission. I read an Advanced Reader’s Edition. Get in line now to pick up your own copy this summer! When writing for children, especially picture books, we need to remember the adult as well. We’ve often heard, it’s the adults who are the gatekeepers to children’s literature. Will they read this book repeatedly? Will they purchase this book? Today I want to add one more, Will they find themselves in this book? Today I did just that. Little Tree is a book about holding on and letting go. It’s a book about facing an unknown future. It’s a book about growing up. It’s written for children. It’s written for adults. I’ll bet, it’s written for you. For a summary of the story and suggested activities for Little Tree look HERE. I met Loren Long, author and illustrator of Little Tree this morning. He was kind and giving with his audience. He shared his story of a little tree with us. It’s a story of watching his firstborn embark on his school career. Not once, but twice. He retold how frightening those experiences were for him as a parent watching his son go off to kindergarten… and then to college. And, we got to meet his son the college student and inspiration for the story, and see what a wonderful relationship they have and watch them work together on a piece of art for the bookstore. The artwork is stunning. And the text reminds me that when you finally let go of something that’s been holding you back, it can be cold and scary. But in the end, you know you that in order to grow… you must first let go. Think back to the times it was hard for your little ones to let go… let go of their binky, let go of diapers, let go of their afternoon naps, let go of your hand in the school parking lot. It was a cold and scary time for them. You were there to dry their tears, give them comfort, help them through it. And think of the times it was hard for you to let go and watch them grow. I think about the times when they fell and scraped their knees, when they boarded their first school bus, when they wanted to be dropped off at the mall without me, when they got their hearts broken for the first time, when they moved out of town. It really did feel like a harsh cold winter. I thought my heart was dying. But each time they came back to me taller and stronger… more of who they were and less of who I was. And it felt good. See, what I mean about writing across generations? Loren Long has done that beautifully. I hope you pick up a copy for yourselves and feel the splendor of letting go as a wonderful thing. One night, a boy takes his flashlight camping with him. After reading a book in his tent, the boy goes outside in the dark. As he walks, he shines the light on the many things hiding in the darkness all around him. He sees a boot lying in the grass, bats flying in the air, mice in the grass, an owl in the tree, skunks behind a tree, sticks in the pond, and a beaver in the dam. The farther he goes into the woods, the more his flashlight reveals to him. At one point, the boy stumbles on a rock and his flashlight is picked up by a raccoon. As all the other animals look on, the raccoon shines the light on the boy. The other animals each take a turn shining the light on the boy. Bit by bit, the boy is revealed to the animals. Eventually the light is shone on the boy’s tent. He returns to the tent and his book, and a family of mice hold the flashlight for him so he can read. 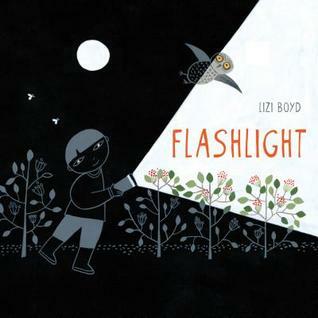 Lizi Boyd tells this story without words and with loads of imaginative, fun, light/dark artwork. In addition to the flashlight illuminating the story as it unfolds, there are tiny peepholes on each page foreshadowing the next page. I can’t wait to share this picture book with a very inquisitive and not-sleepy granddaughter at bedtime. I know she’ll love exploring this little boy’s environment from the darkness of her own bedroom.